The fans and supporters of popular musician turned politician Robert Kyagulanyi alias Bobi Wine on Saturday were entertained as they enjoyed some of their favorite music from the pop star during the Kyarenga concert at “One love beach” Busabala. Bobi Wine who had been denied twice a chance to stage the concert at the national stadium of Nambole finally decided to host the event at his own “One love Beach” in Busabala. The concert was hugely successful as an estimated total of 15,000 revelers turned up and enjoyed music from several top artists in the country. Although the police had warned Bobi Wine not to turn the concert into a political rally, it gradually changed topic into the same as several musicians used the platform to declare their political ambitions and interest in political offices especially the legislature. Several members of the opposition also attended the concert. Majority of revelers were dressed in red, a color locally popular among the opposition supporters. It was hugely a uniform of red T-shirts and red caps forming a red canopy of fans at the concert. 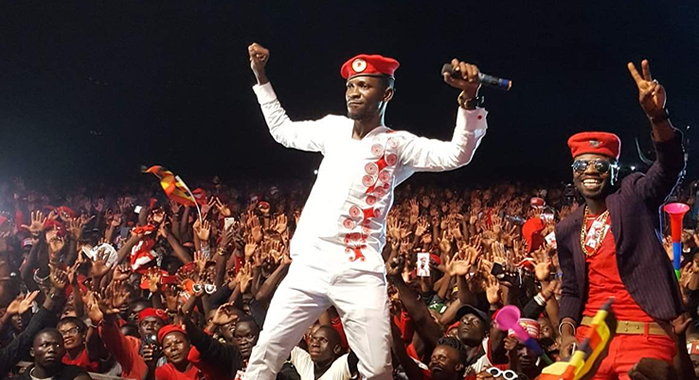 Musically Bobi Wine is popularly known for his politically motivating songs that include among others “Freedom” and they played a big role in rallying his fans to the concert. Having anticipated a politically entertaining atmosphere at the Busabala beach, the fans turned up in large numbers to confirm their support to the former “Ghetto President”. Bobi Wine did not turn down his fans in that regard as he made some powerful political comments once he stepped on the stage. The popular artist turned politician was heard urging his fans to get national IDs in in order to participate in the 2021 elections. He also called upon the government to listen to the voices calling for change of leadership. He also thanked the Uganda Police for providing security during the concert and not stopping him as they have always done. Kyagulanyi added that they are peaceful people but they want to be listened to. Before 2017, Bobi Wine was merely known as local musician majorly promoted by his political and welfare music. However in 2017, he declared his interest to run for a parliamentary seat during the Kyadondo East by-election, which he subsequently won. Since then, the musician turned out to be a leading opposition political figure majorly boosted by the fame that he had already attained as a musician. Once he entered Parliament, Bobi Wine used his popularity among the fans to campaign for several opposition candidates who all won the various by-elections something that put him at loggerheads with the NRM government. In September, Bobi Wine together with other three opposition members of Parliament were arrested in Arua district following the stoning of one of the President cars during the Arua Municipality Parliamentary by-election campaign. Subsequently the legislators were charged treason and remanded to prison together with other 33 suspects. The detention of Bobi Wine and his alleged torture by security forces sparked off several protests in different parts of the country and due to increased pressure from his supporters, treason charges against him were dropped and he was also given bail. Bobi Wine turned out to be the winner after all these events as his popularity among Ugandans was increased and many started seeing him as a potential candidate for the presidency given his brave confrontation of President Museveni who has been in power for 32 years.